This application note was designed to display the sound captured by the Pmod in the serial plotter. Fritzing file displaying the connection of the Pmod MIC3 to the Arduino Uno. Please note, this setup is the same for the connection between the Pmod AD1 and Arduino Uno. 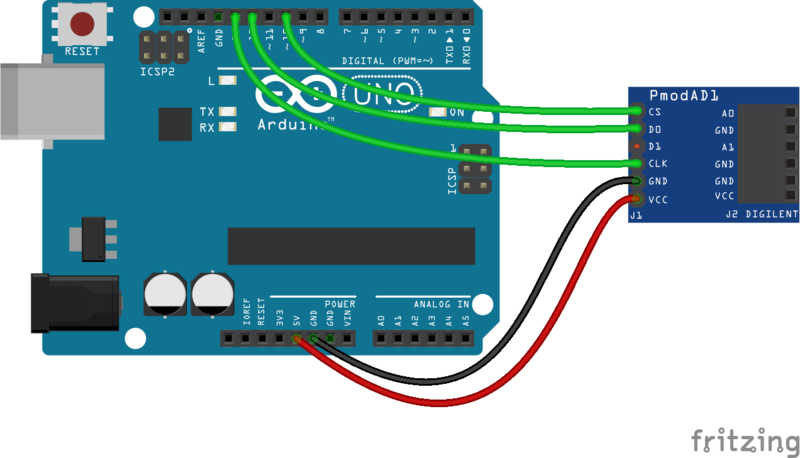 Fritzing image displaying the connection between the Pmod MIC3 and Arduino Uno. Please note, this setup is the same for the connection between the Pmod AD1 and Arduino Uno. Using this code will display the sound captured by the Pmod in the serial plotter. * The sound captured by the module is displayed in the serial plotter.